From my Lutheran tradition of faith, I wish you a Happy Christmas. I also wish a happy holiday season to all that follow other traditions! 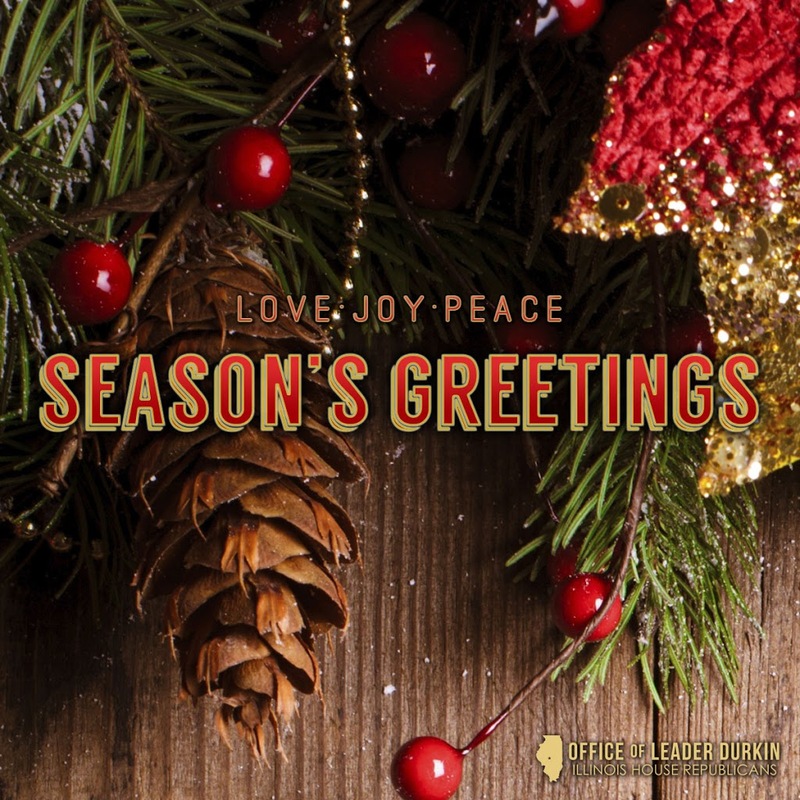 I hope this greeting finds you and your family well and enjoying a season filled with joy and fellowship. I’d encourage you to take an opportunity to be reflective on what 2018 brought us, that you will understand how our humanity and our condition manifest itself and that you seek to make our world a better place as we enter into 2019. Before we wrap up 2018, I would like to take this opportunity to share with you a list of new state laws that take effect on January 1. Please scroll below to view the listing along with other updates that may be of interest to you and your family. If we haven’t met already, I hope to have the opportunity to meet you in the coming months as I attend community meetings and events throughout the district. Being a strong voice for you in Springfield is my priority. Please do not hesitate to contact my district office in Sycamore if I or a member of our staff may be of assistance to you. You can reach us by phone at (815) 748-3494 or via e-mail at Keicher@ilhousegop.org. Have you heard politicians talk about rooting out “waste, fraud and abuse” in Illinois government – and wonder what, if anything, is actually being done about it? This is a commitment I made during the election process. I frequently asked taxpayers if they felt Illinois spent their money in an effective or efficient manner. I have yet to get a yes to that question. We need accountability for other people’s money we collect in taxes and fees. HB 5957 creates the Commission on Fiscal Responsibility and Reform Act, creating a private sector panel to undertake a thorough review of Illinois agencies and provide recommendations for improvement. The panel would consist of 18 voting members, including three members each appointed by the House Speaker, House Minority Leader, Senate President and Senate Minority Leader, and six members appointed by the Governor with not more than four members from the same political party. This Commission would be privately funded by soliciting contributions to be made to a 501(c)(4) social welfare organization as called for in the bill. Commission members would not be paid. The independent commission would conduct an in-depth review of State agencies with a focus on finding improvements that would increase efficiency, reduce costs, enhance accountability and improve administrative control. The group would also provide opportunities for managerial improvements over the short and long term and suggest specific areas where further study could result in additional savings. Results would be presented to the Governor and the General Assembly by October 1, 2019. The work of this commission will allow us to determine where we can responsibly cut spending without adversely impacting state services for the most vulnerable. We have an obligation to ensure that State government is operating as efficiently and effectively as possible. We must conduct this deep dive into our agency operations with a focus on finding where outdated and redundant processes can be eliminated or combined. We must also set policies in place which demand greater accountability from those stakeholders which come to the state asking for appropriation of taxpayer money. It’s time for them to show us how well they’ve spent the money we’ve given them before we give them more. The other legislation, HJR 141, provides the legislative intent for the establishment of the Commission and points to the State’s obligation to provide public services necessary to ensure the Illinoisans can live in dignity and safety in a manner that does not overburden taxpayers. Sheriff Roger Scott has announced the offering of the 25th Sheriff’s Citizens Police Academy beginning January 10th, 2019. The Sheriff’s Office and The DeKalb County Farm Bureau have sponsored the academy since 1996. Participants must be at least 21 years and live or work within DeKalb County.The academy is scheduled to begin Thursday January 10, 2019 and will conclude with graduation celebration at the DeKalb County Farm Bureau on March 21st, 2019. Classes are from 6:30 p.m. – 9:30 p.m. for 10 consecutive Thursday evenings and will be held primarily at the Legislative Center in Sycamore and the Community Outreach Building in DeKalb. The academy is not meant to prepare individuals for a law enforcement career, but is educational opportunity for DeKalb County Citizens, and has been developed to give citizens a realistic view of the Criminal Justice System in DeKalb County. Citizens from all walks of life have enjoyed and graduated from the academy. Instructors for the academy include deputies from the Sheriff’s Office, and others from other segments within the Criminal Justice System. Academy topics cover several areas including arrest procedures, criminal law, investigations, domestic violence, traffic stops, telecommunications, corrections, judicial perspective, active shooter response for citizens, and other topics. Many of the classes include optional hands-on involvement by members of the Academy. Those interested in learning more about the Citizens Police Academy may contact the Sheriff’s Office by calling 815-895-7260, or by stopping at the Sheriff’s Office at 150 N. Main St. Sycamore. “Survivors of non-fatal strangulation have known for years what prosecutors and civil attorneys across the country are only starting to learn: Many domestic violence offenders and rapists do not always strangle their partners to kill them: they strangle them to let them know they can kill them – any time they wish. Once victims know this truth, they live under the power and control of their abusers, day in and day out.” Recent statistics compiled through the county’s new Lethality Assessment Program on 18 calls received in October, 73% of those victims experienced strangulation. · Most strangulations cases produce minor or no visible injury. · Many victims suffer internal injuries, including permanent brain damage. · Strangulation is a gendered crime: virtually all perpetrators are men. · The lack of physical injury too often leads the criminal justice system to treat most “choking” cases as minor incidents. · Strangulation is one of the best predictors for the subsequent homicide of victims of domestic violence. · Strangulation needs to be taken seriously by all members of the criminal justice system, including the police, prosecutors, victim advocates and medical providers who come in contact with these victims. · New laws and policy need to be created to respond effectively to victims. This training was a first step for DeKalb County professionals who come in contact with strangulation victims. The State’s Attorney’s Office will work to establish an implementation plan for investigators, prosecutors, medical providers and advocates to strengthen and coordinate their response to victims of strangulation in DeKalb County and treat them effectively before they suffer brain damage or become homicide victims.